GQ Electronics Technical Support Forum - My thoughts on GMC 500+ - not great for field use. I had a chance to test my new GMC 500 Plus v1 for few days. It's a nice counter, the sound it produces is great (while it works), but I won't be taking it with me too often due few factors. 1. Thee the time it takes to average the result. I can't find the exact number in the manual but it takes at least 40-50 seconds to show the accurate reading. Fine for hanging on a wall to measure background or in lab conditions, not so fine when holding steady in hand trying not to touch a sample. 2. Unable to block beta radiation and measure only gamma without some homemade metal plates. This really should be an extra available for purchase. 3. Exposed tubes and electronics. I don't like having to carry plastic bags with me just to protect it from a rain. 4. There's no easy way to store it. A pouch with a hook to hang it on a belt or piece of clothing would be great, I'd even pay extra just to have one and not have find something that fits. 5. As for the sound - I love it, sounds like an old-school counter unlike many other modern units producing electronic beeps. Sadly it goes silent above certain CPM value. :( It sounds like the ticks blend into one and the speaker or driver can't cope with the frequency, so it becomes silent. I was hoping to use it for videos mainly due to the noise it makes but it simply goes silent in places that I wanted to film. Oh well, on a wall it goes and my search for a perfect counter continues. Did it ever occur to you that there might be a reason why it takes 1 MINUTE to determine CPM, which is counts per MINUTE? And even when 1 audible click is as short as 1 millisecond, could you imagine that you can't here anything, when the counts come quicker than 1 millisecond apart? Good luck for finding a counter that beats the basic physics! Did it ever occur to you that with some simple maths it's easy to tell the CMP by measuring a sample for, let's say, 15 seconds, and multiplying the results by a factor of 4 for a quick estimate, like many other geiger counters do? Again, I haven't encountered this issue with any of my other counters. I'm simply stating my observation and you're being angry like if I insulted your mother. It could be easily programmed to beep constantly instead of the silence above certain frequencies. @user06: I won't hold that against ullix, it is how he sometimes treats people in the forum (which I agree it is a bit offensive). But he is a brilliant guy and very capable of helping everybody! Anyway, I suppose that the CPM calculation is not extrapolating to 1 minute because it would be that, just an extrapolation that is not real. I suppose that there could be a menu option to define the time required to get the CPM reading (from let's say 15 to 60s). You can ask for that to EmfDev, GQ is very responsive for the users' requests. I have not seen the counter going mute at high CPMs. I cannot drive mine at such an amazing numbers (400 kCPM, what the hell is that! ), but Stargazer_40 could confirm what is the sound of his 500+s (V1 and V2) when driven at 100 kCPM. I would expect a continuous tone. There is also the possibility that you are facing the V1 hardware flaw of not having enough voltage in the HV PS. The M4011 tube should be totally saturated (it cannot count more than 300 kCPM by design), so your device is using the SI-3BG tube and combining the reading in a weird way (that algorithm is not totally developed in the V1). Try updating the firmware to v1.23 and physically remove the M4011 tube from the inside (the long black one) and select only tube 2 for the readings in the menu. Your results at such high radiation would be much more reliable! I think that you bring up two excellent points. First, the meter records data in CPS but doesn't display it. There could pretty easily be implemented an 'Instantaneous' measure of CPM that would handle rapid changes in count rate as you move quickly through an area. When I put a high energy source in the vicinity of the M4011 tube it's fairly easy to know that field has changed dramatically because of sound, but I still have to wait for a minute to go by to see actual CPM. If you are in tens of thousands of CPM, the CPS might be stable enough to give you a good idea of CPM by simple multiplication by 60. Or GQ could provide a count factor to average and convert - 5 would multiply average CPS by 12, 10 would multiply average CPS by 6, etc. On the plus side you do get both an alarm and the count ticks when they go high, and a flashing 'High' indicator on the lcd. Not sure if alarm sounds when converted CPS goes higher than CPM threshold or if you have to wait a minute as well. And I also like the steady ticking of the meter at a little more subtle rate when above a certain threshold. Perhaps GQ could add these features. Given that high counts through the speaker affect the screen orientation, I have been turning off the speaker for the 5 uCi tests. It's why I like the steady beat through the speaker concept that user06 suggested. Slow enough not to flip the screen around, with 'High' flashing on the LCD. I haven't given much thought at all to the lack of water resistance, or open case design for betas. Not a big deal to throw in a baggy if out in the elements and in an indoor or lab environment I don't see an issue. Friable samples and food are easily dealt with in baggy, but I think you'd not want to do that with an alpha detector like the 600/600+. Thanks for the reply guys. A simple freezer zip lock bag does a good job at protecting it from rain, sand and other factors and you an even find more sturdy bags to hang on your neck in camping or army supplies shops, but it's just extra hassle to find one that fits it well. It's a great counter with many advanced features considering its price so I'd be happy to pay a bit extra for those accessories as most people don't need them included. Ecotest Terra comes with a leather + acrylic pouch with a a metal clip for attaching to belts, which makes it extremely easy to carry around and offers some degree of protection from the elements (and contamination). I'll suggest the software options to the devs, an option of switching to CPS or even 10-seconds extrapolated measurement interval when a rapid change is detected would work perfectly for me. I should have a short clip with the counter going silent somewhere on my gopro, I'll post it when I got some time. Sadly due to the long CMP estimation time I couldn't tell at what exact value it happens. Oh, and I agree with ikerrg's comment - @user06, what the heck were you measuring that provided you over 400,000 CPM?????? Hopefully you left quickly! And then 485,000 CPM in the lower photo. Meter is certainly making use of the SI3BG tube. 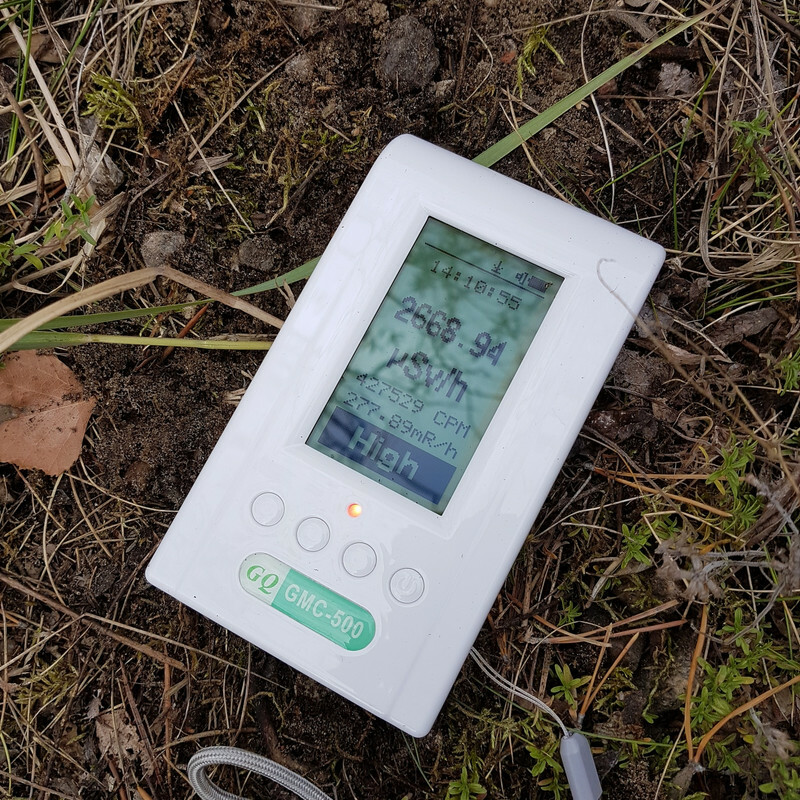 @Stargazer40 - Likely a piece of reactor fuel or graphite moderator buried in the soil near Chernobyl, about 2.5km from the reactor 4 building. They're particularity common in the area I was searching in a hope to find a larger piece. That one hot spot was likely few smaller particles clumped together, after a bit of digging I got lower reading but on a larger area. The other sample looks like piece of roof insulation or something similar, hard to say its exact origin. Could be a piece of debris from the explosion or even something dropped from a vehicle taking part in a decontamination. This one was in an area where several bulldozers and military vehicles were dumped, their tracks and undercarriages still give out high readings. 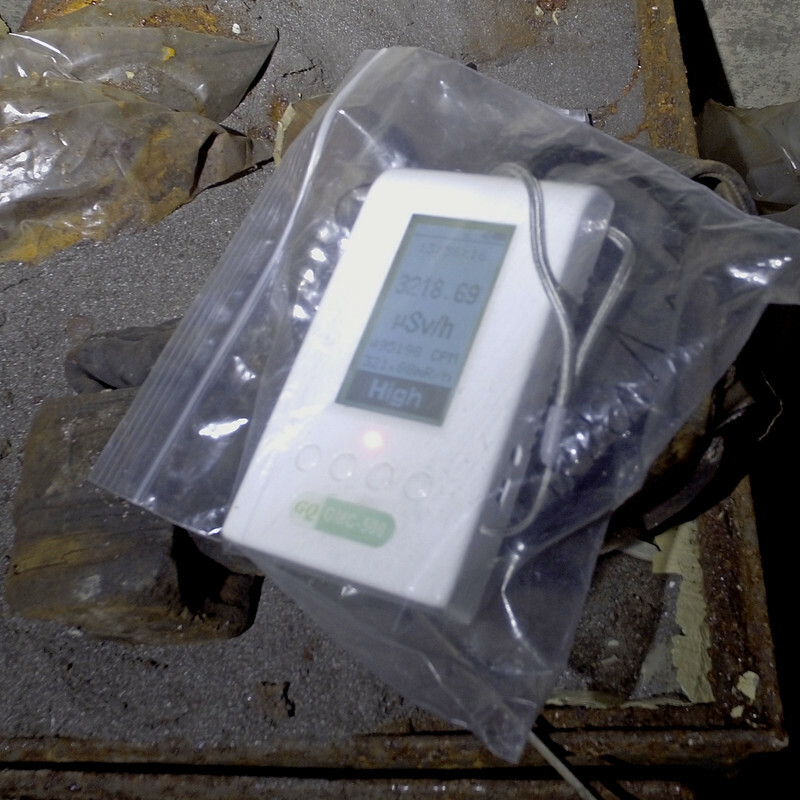 It's in a woods, about 3km in a straight line from the reactor in the opposite direction from the first sample. And before anyone starts panicking, I use wet wipes, test everything afterwards etc. As long as it's not swallowed, a minute of poking around those samples won't be any more dangerous than a tooth x-ray during regular dental check-up. As I said, I think (and I am very interested) that you should remove the M4011 tube (it is crippling you counter at that high radiation), and use the SI-3BG tube only. Your counter would be much more insensitive, which is good for the equivalent of 450 kCPM with the M4011. It would be nice to see if you can actually reach some big number of CPM when using only the SI-3BG tube. 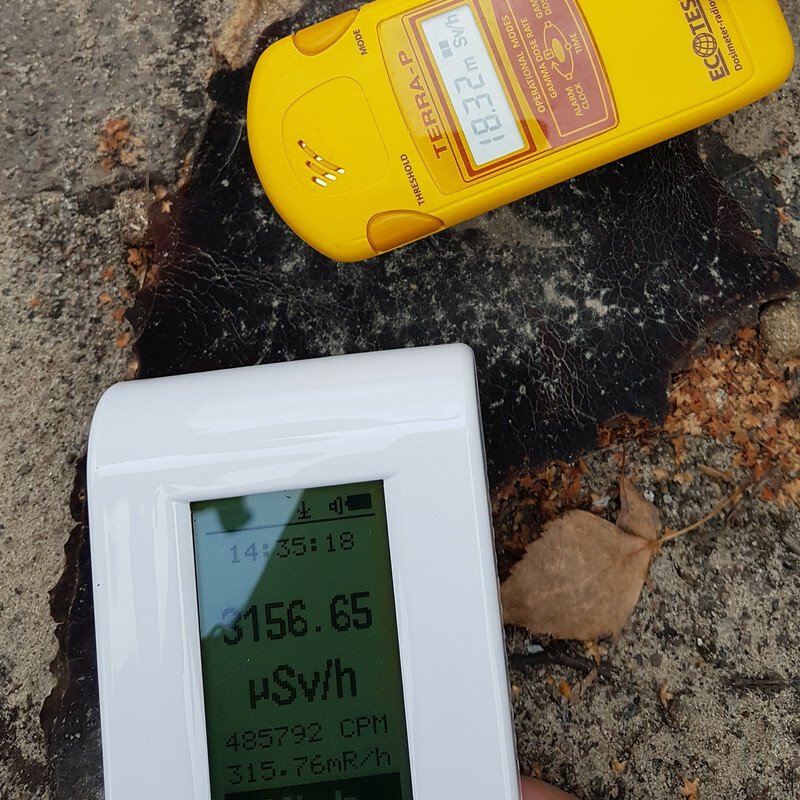 And that possibility is quite unique in GQ's 500+ counters, afaik you would not be able to measure such high radiation with any other cheap counter in the market. If you do care about the uSv/h number, I recommend that you set your calibration 3rd point to 25 CPM - 12 uSv/h. That is the best that we have until now for gamma radiation (as ullix found), but for beta (which is probably what you are mainly reading so close to the sample at 450 kCPM) the number would be much closer to 100 CPM - 300 uSv/h. I might give it a try next time. Gamma would be much lower there, sadly I let someone else use my Terra with metal shield over the tube for filtering out beta radiation so I couldn't compare them, but if I remember correctly that spot gave around 100uSv/h on gamma alone. Same for the dust in the boxes on the 2nd photo, I've seen about 1mSv/h gamma there, gamma + beta gives about 3.6mSv/h and I imagine the GQ 500 meter being much more accurate. 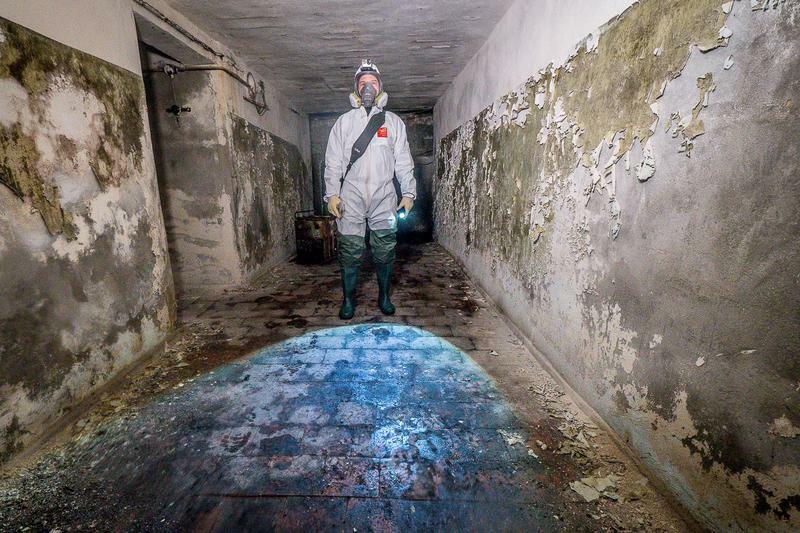 Nasty place, but I went in there dressed in good coveralls with full face 3M mask with ABEK1 + P3 filters. I now understand your concerns about the device insulation! That is messy! That gamma level would be great to finally characterize the tubes! However, I understand that you won't be able to assemble and disassemble the device while in there (to connect and disconnect tubes). In any case, my recommendation would be that you use the Terra for when you are far away trying to find a radiation source, and the 500+ (with the M4011 tube removed) to actually measure the radiation source. You could do both things with the new 500+ V2. I'm not really a typical user so I don't expect GQ making all those changes just for few people foolishly poking around reactor fuel, but I'm sure they'd get many more customers from people who explore those places. So far Terra and Gamma Scout seem to be the most popular among my friends but both have their limitations and accuracy at higher radiation levels is nonexistent. If GMC could come with a model in a sealed case with shorter average CPM & uSv/h readout time, it would be a serious alternative for those two in its price range. OK, but I insist. It would be helpful for the forum if we can see the insensitive tube being driven at such high radiation! The most we have seen it until now is inside an Xray machine with 228 CPS for only 1 second (that would be 13680 CPM if extrapolated to 1 minute if the radiation was constant, i.e. about 6.57 mSv/h!!). But you would need to disconnect the other tube inside to get a good measurement. The sound should be normal at that count rate and you should be able to notice if radiation is increasing or not just by hearing. The SI3BG tube is way ahead of even the best of the personal meters, the Mizur 900 ($600USD). That stops at 1250 uSv/h. Totally agree with ikerrg that you should pull the M4011 for places like this and simply go with the SI3BG. And for safety's sake I think you ought to add some enclosed goggles or a hood with vision ports. I would hate to expose mucus membranes to any dust that could wind up in and around the eyeballs in the orbital lobes (is that a danger here?). Whoops, now I see - full face mask. Sorry. The SI3BG tube is way ahead of even the best of the personal meters, the Mizur 900 ($600USD). That stops at 1250 uSv/h. Totally agree with ikerrg that you should pull the M4011 for places like this and simply go with the SI3BG. @user06: Great experience! You are a hero. Thank you for sharing. Beware, remove the M4011 tube will cause wrong uSv/h reading on GMC-500+ V1 earlier than V1.23 version firmware. Unless you only want to see CPM from SI3BG tube. With V1.23 or later version firmware, you can select only SI3BG tube, then after remove M4011 tube the uSv/h reading should be good. Yes. The software should take control of the speaker if the pulse frequency exceed some level, so that to keep speaker continually sound. The GMC-600/+ models have fast CPM estimate option from menu(5s,10s,15s,20s,30s,60s options). I think that should be added to the GMC-500+ too in this kind of situation. That is why the first thing that I proposed was to update to v1.23 firmware. But remember that the uSv/h is just an approximation in any GM counter based radiation measurement. The calibration depends on the type of radiation, the energy, etc. and, unless you know that in advance, you are only going to get a rough number. Use the numbers that I proposed in a previous post if you at least know if you are going to measure beta or gamma radiation. I did not know that the GMC-600 models had already that option. It is a very simple firmware change, so thumbs up for including it in the 500+ V1 and V2! It's under the User Options. Line item is Fast Estimate Time. When you select you get a pop up window that you can scroll through options ZLM mentions. I agree that this should be a quick and easy upgrade to the 500+ V1 and V2 firmware. Don't forget that GQ has all the GM meters in software demo form on the download page. You can download the 600/+ demo and play with this and other options. Good point. I used that before purchasing my first 500+. However, the firmware of the 500+ in that simulator is so outdated that it is not a good representation of what the 500+ (V1 or V2) can do. GQ might need to update those downloadable demos. From my work with the 5 uCi source and of course mixed gammas and betas I got a number I'm currently using for the third calibration point of 34.75. In between the numbers that ikerrg is recommending, but I think supported by my measures. I need to go back and look at ikerrg's and EmfDef's tube mixing algorithms in earlier threads, but the CPMs shown by user06 are exceeding the design limit of the M4011 tube (from ikerrg at 300k CPM), so I take it that the firmware is calculating CPM number displayed, taking the SI3BG measured CPM and converting it to a combined M4011 CPM for the uSv/h conversion? Using the conversion factor I get for the SI3BG tube, it would be actually seeing between 1900-2300 CPM (roughly 4-5X what I was measuring with the 5 uCi source at 500 CPM in the V2). And no significant deadtime for the SI3BG. I do not know the firmware version in user06's 500+, but if it is using the default combination algorithm and the default calibration factors, I think that the M4011 tube might be a bit quicker than we estimated, i.e. 150 us (the SBM-20 is 190 us), and therefore its maximum count rate can be around 400 kCPM. For that CPM in the M4011, you need about 14 kCPM in the SI-3BG to get a reading of 2700 uSv/h using the combination algorithm. The CPM in that combination algorithm is just the sum of both tubes CPM, that is 400 kCPM+15 kCPM = 415 kCPM. Give or take CPMs in the M4011 and/or the SI-3BG and that is approximately what it is happening, I suppose. So you're backward calculating the deadtime from the actual counts we're seeing on user06's 500+ V1 and the GQ calibration factors. I like that, as it says the meter is now presenting us seven times what ullix predicted the 500+ would be limited to as to usable CPM rate. We also don't know what voltage GQ established in user06's meter when it left the shop. Likely close to saturation for sure, but it keeps on ticking. I'll change my deadtime factor to 150 usec. Think it makes more sense given readings we're seeing here. BTW, your estimated 14k CPM is 3.4% of the total counts. Still leaves large margin of error for what actual counts of both M4011 and SI3BG are without seeing on the display. Yes, it is very difficult to know, everything is a coarse estimation. My logic for the CPM is that if the total CPM shown on the screen is the sum of both tubes' CPM, then the M4011 must be measuring more than 300 kCPM, as I do not expect the SI-3BG to be measuring 120 kCPM. Using the spreadsheet with the original combination algorithm I tried different values to match the reading of 2700 uSv/h, but there could be other combinations giving similar results. Probably it would be something approximately close to what I estimated. What I do not understand is how the tubes are still ticking with the HV PS probably at very low voltage levels. I suppose that the tubes might stop counting until the PS recovers the voltage, and therefore it would be better if the picture was showing the graph screen with what was happening every second. So he might be getting 0 CPS at different intervals until the HV recovers, and what we see in the picture is the total CPM. It is a pity that the device was not showing the CPM of both tubes! I believe that we aren't fully realizing that the tube voltage always drops well below the starting voltage at every count and needs to come back up during the deadtime. That it's not getting back to the plateau region is the only issue here. It always gets back to the starting voltage and delivers the next count. So the deadtime is the limiting factor and the back calculation based on actual CPM seen at the meter is the best way to approach that number through estimation. Yes, you might be right. But I suppose that it depends on the capability of the PS to keep the voltage when the pulses happen continuosly with the minimal time interval (the dead time). I think that the PS easily recovers the voltage during the initial pulses every, let's say, 150 us. But at some point after many pulses (inside a 1 second interval) it might collapse and there would be no pulses for a longer time than the dead time. You would not be able to see that behaviour because it happens quicker than the resolution time of 1 second. So we might be watching a combined dual effect, one coming from the tube's recovery time (dead time) and other from the HV PS energy capability. In user06's first post to forum he states that his 500+ has firmware version 1.18. Just so we're on the same page with that. Ok. I didn't know that. I need to check what was implemented in that version. But the sum of counts has always been there.